Animal Friends and Picksiebners in the campaign "Life on a Chain isn't Life"
Five members of the band Picksiebner – Marko, Vedran, Gordan, Zoran i Andrija – appear on billboards and City Lights posters in Croatian cities to express their disagreement with keeping dogs on chains, and warn that it means lasting suffering for animals as it causes them pain and depression, and often makes them aggressive. Dogs, especially in smaller, rural environments, are kept permanently chained on a regular basis. The chain constrains their movements and forces them to spend their lives in deplorable conditions. Often they are unable to protect themselves from the weather and they eat and defecate in the same place. Also, there have been numerous cases where the chain has cut into dogs' necks. The greatest suffering for the dogs is psychological. These sociable animals long for socialization and movement and every day on a chain prolongs their agony. Frustrated and sad, they often go crazy, and even become aggressive because of such treatment. Picksiebners have expressed their readiness to help animals several times before. They recorded the song and video for "Prica o cucku" with Ibrica Jusic, as support for the organization Noah's Ark. In June this year they participated in a protest to stop the killing of healthy dogs and cats by the veterinary inspection and to open the shelters. Then in September they supported the 5th ZeGeVege Festival of Sustainable Living with a performance. Now they are joining the latest Animal Friends campaign "Life on a Chain isn't Life" by being photographed for the ads and leaflet. Why Picksiebners responded to this invitation to collaborate with Animal Friends is best explained by the musicians themselves, who sent this message to all who keep dogs on chains: "Free dogs from chains, nobody deserves such a life." They are also joining in on Animal Friends' invitation to all Croatian citizens to sign the petition for the legal ban of keeping dogs on chains, which is available on www.prijatelji-zivotinja.hr, and to write to the Ministry of Agriculture asking for such a regulation to be added to the Animal Protection Act. Picksiebners are also helping animals by playing for free at a charity concert for Noah's Ark. On November 16, 2012, Picksiebners, along with Ibrica Jusic, Kawasaki 3P, Valungari and Corto, will be performing at Tvornica Kulture and all visitors will have an opportunity to sign the petition. With this campaign, Animal Friends and members of the band Picksiebner want to remind citizens that dogs and other animals are living beings who have their own needs and feel suffering and pain from neglect and abuse, just like people. Those who do not have the ability to properly care for animals should never take them. This would prevent animal suffeing and and tragedies in which people and other animals are casualties. State and local authorities have an increased responsibility to educate citizens and encourage a culture of treating animals like sentient living beings. Keeping dogs on a chain should be completely banned under the Animal Protection Act, as well as tying cows and any other animals. 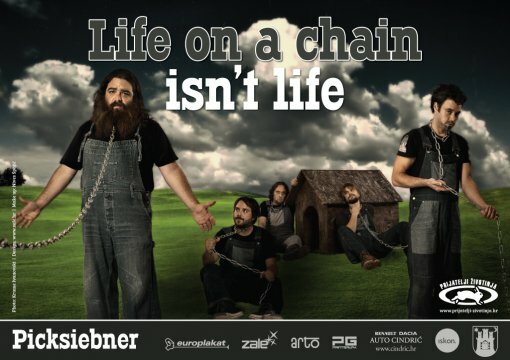 The photograph for the poster "Life on a Chain isn't Life" was shot by Krume Ivanovksi, make up was done by Nives Spajic, and the ad and leaflet were designed by Maja Zaklan from Design Studio Zale. Campaign "Life on a Chain isn't Life" was supported by the City Office for Agriculture and Forestry of the City of Zagreb, Iskon, Europlakat, Arto, Print grupa i Auto Cindric.